The vice-president of a company went to the chairman of the board and said, “We are thinking of starting a new program. We are sure that it will help us increase profits, [but / and] it will also [harm / help] the environment.” The chairman of the board answered, “I don’t care at all about [harming / helping] the environment. I just want to make as much profit as I can. Let’s start the new program.” They started the new program. Sure enough, the environment was [harmed / helped]. Did the chairman know that the new program would [harm / help] the environment? When people were asked to express their agreement with the knowledge claim (on a scale from -3, marked as “strongly disagree”, to 3, marked as “strongly agree”), they were much more inclined to agree with the claim in the harm case (the mean response was 2.25) than in the help case (the mean was 0.91). When people were asked a yes/no question, 68% claimed that the chairman knew that the environment would be harmed while, in the help case, only 16% attributed knowledge to the chairman (84% claimed that the chairman did not know that the environment would be helped). These findings are unsettling for philosophers. Since Plato’s times, philosophical accounts of knowledge considered such factors as belief, truth, justification, and, in the post-Gettier period, resistance to epistemic luck. However, all these factors are held constant in the stories. Could it really be the case that the standards of what is taken to be knowledge depend on whether the effect is good or bad? Could it be that philosophers since Plato have been simply wrong not to include such factors? The findings are unsettling more generally as well. Could it really be that we are more likely to attribute knowledge when something bad is about to happen? Do we think that bad people know more? Is this not simply an irrational prejudice? Since we are tried in court when something bad has happened, it seems that we would be much more likely to be claimed to know in court than in ordinary situations. Would this not disadvantage us in legal proceedings? One of the results of our previous project was an explanation of ESEE that upholds the rationality of the answers chosen by most of the respondents. On that account, when people are inclined to claim that the chairman knew that the environment would be harmed, they really claim that the chairman knew that it was a possible consequence of his action that the environment would be harmed. This claim is particularly salient when the agent’s action has consequences that violate some norms. Moreover, the consequence-knowledge claim can be true even if the probability of the outcome is very low. Indeed, this explains why ESEE is present in such cases. When the vice-president says that there is only a very slight chance that the program will affect the environment, people tend to claim that the chairman knew that the environment would be harmed even though they do not make this claim in the help case. The project will develop and investigate this hypothesis. We will attempt to answer several questions: • Can the account explain similar effects for other concepts (in particular belief and probability)? • Can the account explain the data gathered in the context of the so-called Gettier cases? • Is it possible to eliminate ESEE by manipulating the salience of the consequences? • Is it possible to eliminate ESEE by engaging the respondents in self-reflection and theoretical reflection? 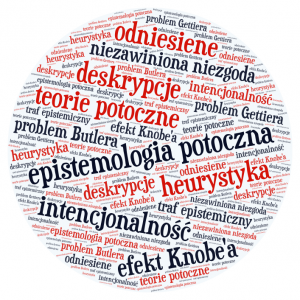 While most of the research will be conducted in English, we also want to do some studies in Polish. Our preliminary studies show that ESEE does not occur in Polish. This calls for a philosophical as well as a linguistic explanation. The result is striking from a linguistic point of view because the verb ‘to know’ is taken to be one of the very few semantic primitives present in all languages.